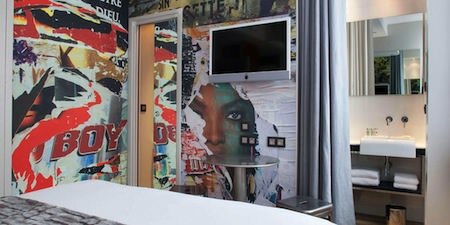 Hotel Georgette Paris is a three-star boutique hotel in the Beaubourg (3rd arrondissement) district of Paris, a lively area filled with cafes, bars, restaurants and nightclubs. It is one block from the famous Centre Pompidou which houses the National Museum of Modern Art and it is only a few minutes walk from Rue Montorgueil, a pedestrian-only street lined with patisseries, chocolate shops, restaurants, gourmet food stores and cafes. The Beaubourg district is also known for cutting-edge fashion stores that cater to a young, hip crowd. 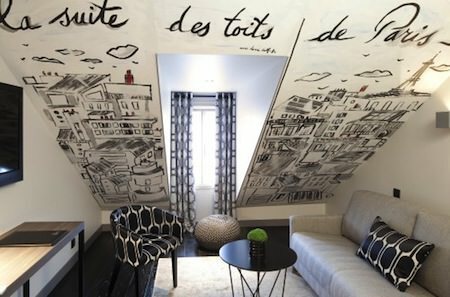 Hotel Georgette Paris boasts 19 artistic rooms, each one as bright and unique as the other. 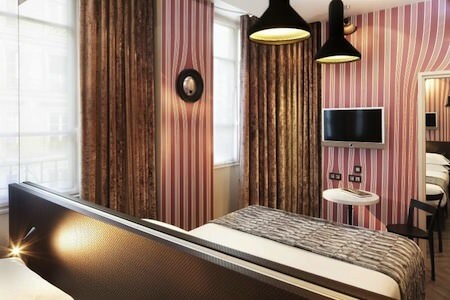 The fresh, modern ambiance of the rooms provides a stark and wonderful contrast to the historic streets below. With a focus on art, bright pops of colour (greens, pinks, yellow) greet guests throughout the hotel. Spectacular chandeliers and striking art pieces round out the décor. Among the contemporary artistic themes to choose from are Pop Art style, Dada and New Realism. Tomato cans in the style of Andy Warhol hang on the walls of the Classic Room; a faded pin-up girl poster can be found in the Superior Room; and graffiti-style décor is painted on the wall of the Deluxe Room. Guests are surrounded by art during their entire stay at Hotel Georgette Paris. There’s also free Wi-Fi plus national and international newspapers in the lobby. All rooms are air-conditioned and include a mini bar and television. A full breakfast is available from 7:00 to 11:00 am, with the possibility of room service upon request. Parking is available nearby and the hotel is easily accessible by subway on line 11 via the Rambuteau stop and line 4 via the Etienne Marcel stop. With such convenient metro stops nearby, the main attractions in Paris, like the Louvre and Notre Dame Cathedral, can be reached with ease. Actually you can walk to the Louvre from the hotel. Hotel Georgette Paris is truly a one-of-a-kind boutique hotel in Paris: it is affordable, centrally located and beautifully decorated.